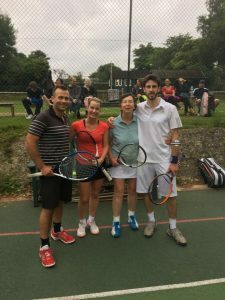 The mixed doubles final is normally scheduled for Thursday of the second week of the tournament, and indeed all the required players were present. However, Greg Lim was involved in a lengthy men’s singles match against Graeme Pearson which he eventually won 7-6 [8-6] 3-6 6-3. 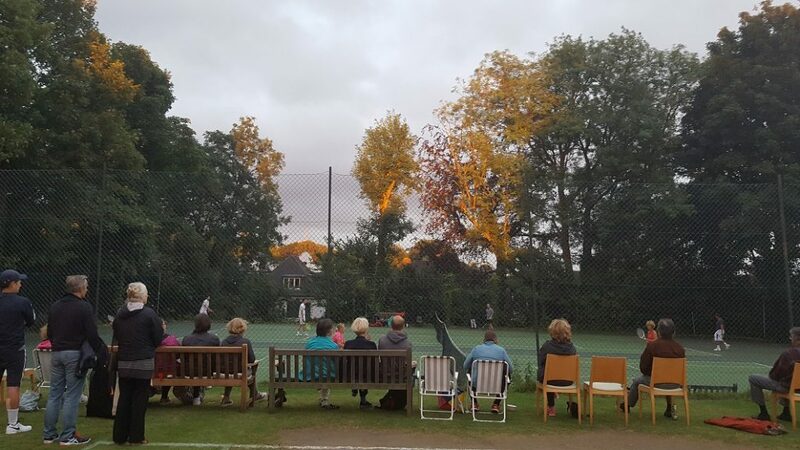 However, by the time that had finished there were fewer than 30 minutes of daylight left, which ruled out completion of the mixed doubles final that evening. 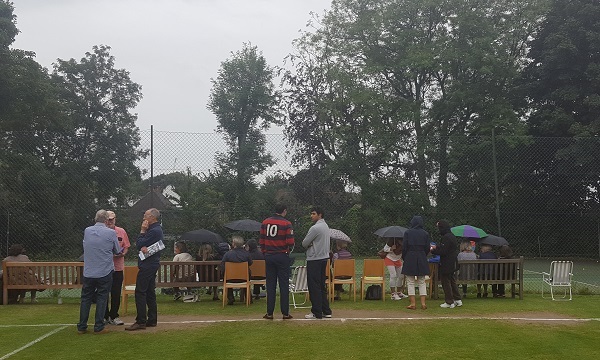 It was decided to postpone the final until Wednesday 9th August – the next date all players could make..
Those who can remember Wednesday 9th August will note that the heavens opened for most of the day, and that the rain was not just drizzle, but downpour for most of that time. Fortunately the weather forecast identified this some time in advance, and, wisely, the final was moved back a week to Wednesday 16 August. Lasagna and pizza were promised to draw in the spectators. The weather this time was fine. 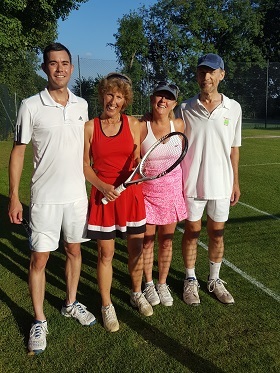 The mixed doubles final was between Greg Lim & Marjan Denis, the second seeds, and Tim Simpson & Anais Reding, the third seeds who beat the champions and top seeds Lesley South & James McKenzie on their way to the final. Barbara Thomas was the umpire. The match itself was a bit of a nervy affair, and victory seemed most likely to go to the side who made the fewer mistakes, rather than being decided by outright winners. Even the ever-consistent Greg was affected, on a couple of occasions . Tim’s serve is of the “go-for-it” type, likely to beat Marjan and end up embedded half way up the back fence on the occasions when it went in, but it didn’t always. In the first set Tim was broken in the second game, but he and Anais immediately broke Marjan back. Then Marjan was broken again at 3 all followed by Greg a couple of games later to give Tim and Anais the first set 6-3. In the second set Greg and Marjan played more consistently and brought sufficient winners and errors from the opponents to take the set 6-1, paving the way for the champions tie break (first to 10 points). 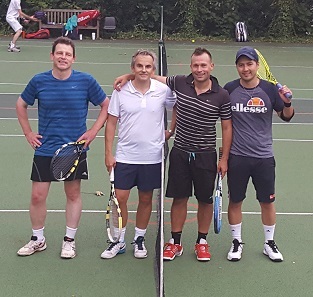 At first Greg and Marjan appeared to have a slight edge in the tie break, but Tim and Anais held their nerve to get even, then zoomed into an 8-5 lead with the help of a couple of errors from the opposition. At this point Sultan Gangji was giving odds of 4:1 on a victory by Tim and Anais, who immediately managed to lose the next 3 points to bring the champions tie break score to 8 all. Sultan’s view then was that Greg and Marjan would take it and confidently predicted that the next point would be a match point. If you think about it, 9-8 in a champions tie break always is match point. With the curse of the commentator upon them Marjan and Greg lost the last two points to give Tim and Anais victory by 6-3 1-6 [10-8]. 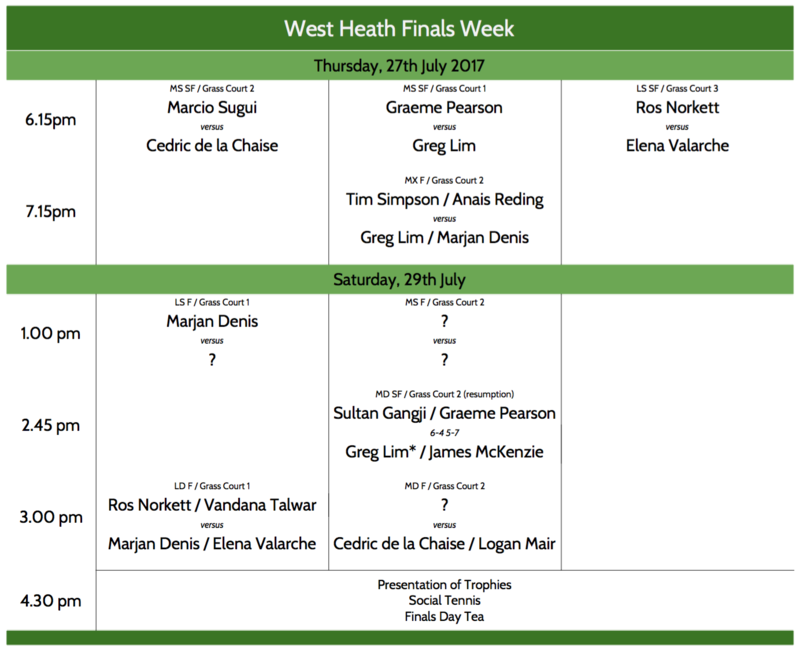 Congratulations to both Tim and Anais, for both of whom it is their first West Heath title. Greg has the well deserved distinction of getting to three finals, unfortunately with nothing to show for it (and is now hoping his friends will buy him drinks to console him). 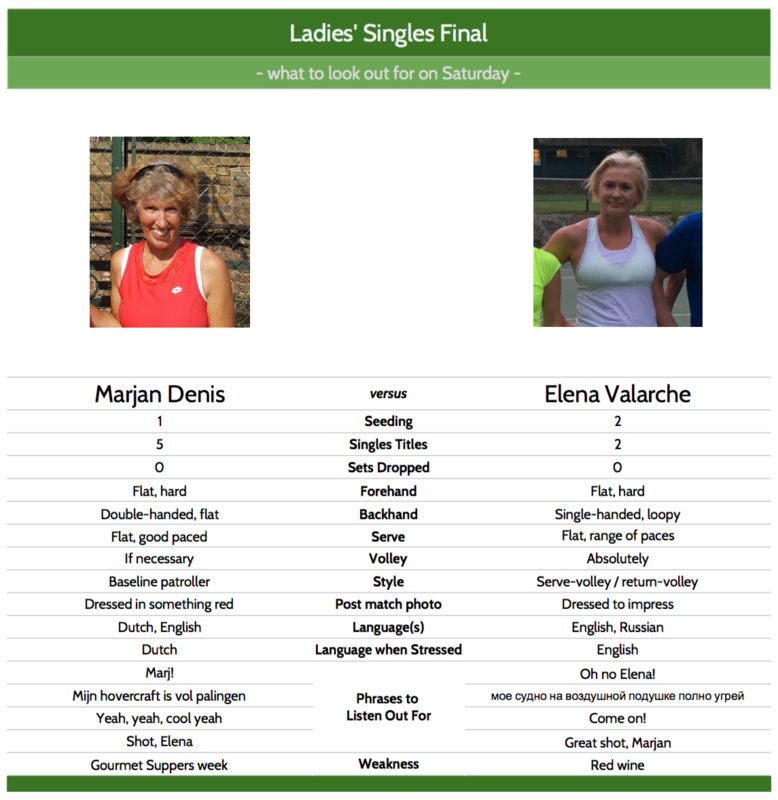 Marjan has also made 3 finals, winning the ladies’ doubles with Elena Valarche. 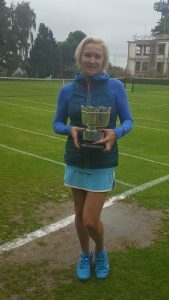 Anais is a relative newcomer and acquitted herself well and we hope will stick around next season to defend her title. Marjan made the lasagna, Greg provided pizza, and Barbara Thomas made summer pudding, which was enjoyed by the two dozen spectators and competitors. All in all a very enjoyable evening watching an interesting match which had the spectators on the edge of their seats. And now the tournament really is over. Enjoy the rest of the season! There was some confusion about the start time of both singles finals, and the weather forecast was far from good. In fact it suggested a huge downpour starting at 2 pm and continuing for at least a couple of hours. However, both singles finals and a champions tie break to complete a men’s doubles match were played on the hard courts, despite the presence of light drizzle. Greg played solidly throughout, with his flat fast groundstrokes, but the even and slow court bounce somewhat played into the hands of Cedric who has a very good eye, solid topspin strokes and, as he warms to his task, can hit the ball very close to the lines without making too many errors. And hit good topspin lobs too, when he has to. Greg played well, but even his lowish error rate was too much compared with that of Cedric who not only put pressure on but also hit accurate winning shots where necessary, such as passing shots if Greg came in, or shots close to the baseline to leave Greg with little time to react and get on balance to make an effective response. Cedric made errors too, but somehow they almost never added up to the games Greg needed to make an impact. In the first set Greg got one game. During the second set the drizzle became a little more pronounced and at one point Greg slipped. But by this time he was 3 games to love down and gamely carried on but perhaps without risking a further slip by chasing almost hopeless balls. 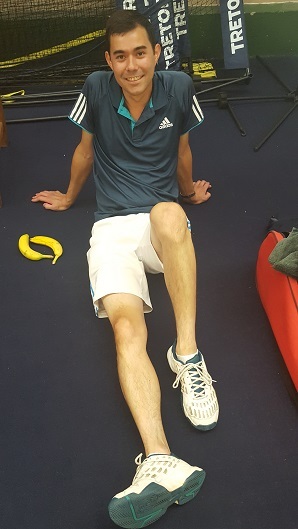 Cedric lost no games in the second set and won 6-1 6-0 to give us the very satisfying champion’s sequence over the last four years of : Graeme Pearson, Cedric de la Chaise, Graeme, Cedric! This was umpired by James McKenzie (replaced towards the end by Barbara Thomas so James could finish his men’s doubles semi-final) and took place between Marjan Denis, the reigning champion, and Elena Valarche, the 3rd seed who has unsuccessfully challenged Marjan for at least two of the last four finals (the record for 2015 having gone missing temporarily!) Marjan had been champion from 2013 through 2016. Elena was clearly up for it, but it wasn’t the best performance from Marjan, maybe because she was nervous of slipping on the slightly damp porous Macadam. From a distant vantage point it looked as if Elena came in a lot in the first set, but not in the second. Elena says this was because it is less of an advantage coming in on a slow hard court where your opponent has much more time to line up for a passing shot. Elena won the match 6-2 6-2 to give her her second singles title. Due to late play and very poor light earlier in the week the men’s doubles semi-final between Sultan Gangji & Graeme Pearson (reigning champions and top seeds) and the third seeds Greg Lim & James McKenzie had to be halted at one set all – 6-4 5-7 on Wednesday night. 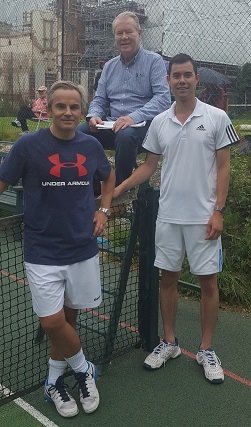 The deciding champions tie break (first to 10 point) was decided on a slippery hard court in front of the enthusiastic but slightly damp set of spectators. 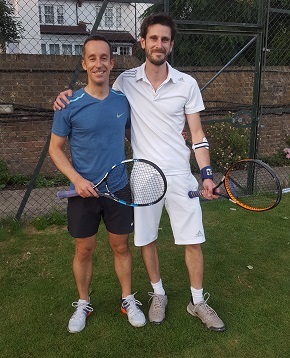 At first it looked like Sultan and Graeme had the upper hand, but towards the end of the breaker James and Greg tightened up their game and were able to put their opponents under pressure, forcing a win 10-7 for a 4-6 7-5 [10-7] victory overall. At this point the rain started to get heavier. Not only would the spectators have got drenched, but there would probably have been a revolution if the players had been asked to play on the now-lethal hard courts. So everyone retired inside to finish preparing tea. And what a tea it was! 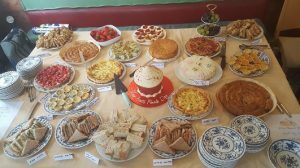 Some expressed an opinion that it was the best Finals Day tea they had ever seen. Decide for yourself. Once the kettle had boiled everyone tucked in. 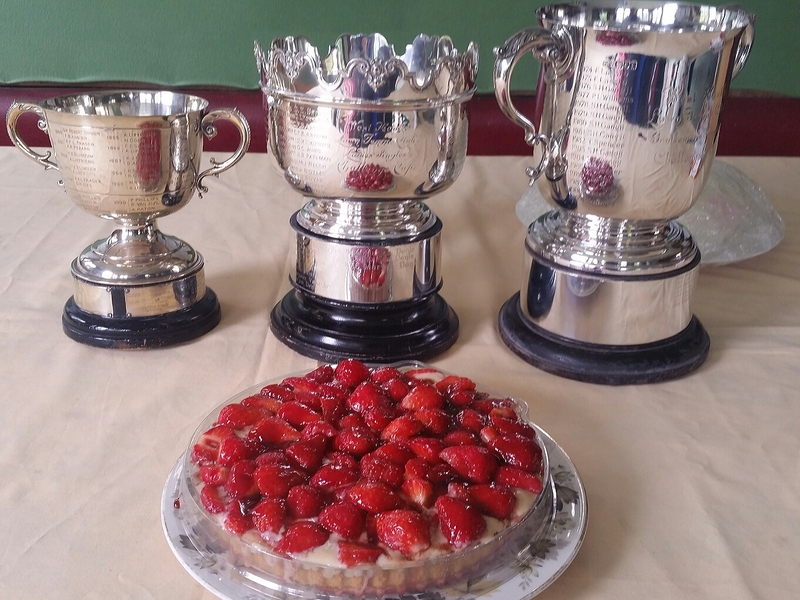 Once hunger and some of the dampness had been dispersed, Sultan Gangji thanked those who had given time to help run the club over the previous 12 months and called on Bill Clark (a member from 30 years ago) to present the prizes to the men’s and ladies’ champions. Bill commented that very little had changed, including the bar area which he and Sultan had spent some time constructing. 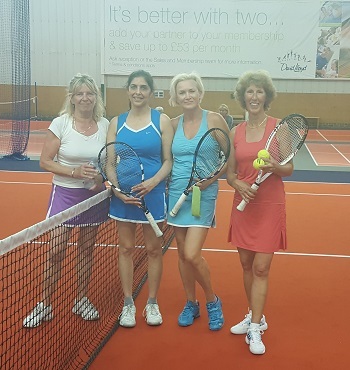 With the hard courts rapidly turning into a duck pond despite their fast-draining powers, Sultan organised a couple of indoor courts at David Lloyd Finchley on which to play the outstanding doubles matches, and 15 people accompanied the finalists. Play started at 6 pm. This took place between the second seeds Cedric de la Chaise & Logan Mair and third seeds Greg Lim & James McKenzie who had earlier knocked out the title holders Sultan Gangji and Graeme Peason. At first it seemed like it might be an easy ride as Cedric and Logan quickly accumulated a 3-0 then 4-1 lead. But Greg and James dug in and forced various errors from their opponents. Not only from Logan, but also from Cedric who missed one or two difficult low vollies / half volleys from around the service line. In particular Greg was commanding the net and any loose shot that Logan played that was in reach got put away. But after leveling at 5 all, Greg and James could not stop Cedric from winning his service game, and then James struggled with his, eventually conceding the set 7-5 to Cedric and Logan. In the second set Cedric and Logan again got off to a fast start, only to be pegged back by Greg and James. For a while it looked like the final might be decided by a champions tie break. But at 4 all with Logan serving Cedric in particular seemed to be putting the ball closer and closer to the lines to make it more difficult for the opponents. Logan held his serve and James was under pressure once more, as he had been at the end of the first set. Three balls from Cedric and Logan seemed to hit the lines in this game making it all but impossible for James to hold, and Cedric and Logan took the title 7-5 6-4. The second seeds Elena Valarche & Marjan Denis played the top seeds and 2016 champios Ros Norkett & Vandana Talwar indoors at David Lloyd, Finchley. Three of the four players are members but Elena took a while to get used to the different conditions. 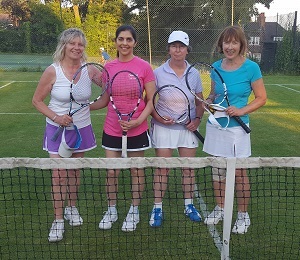 Perhaps as a result Ros and Vandana got off to a flying start and raced into 3-0 and 4-1 leads. Ros’s strong groundstrokes and Vandana’s net play worked well and proved a tricky combination to for their opponents to break down. But Elena and Marjan stuck at it, fought back to 5-5 and then took the first set 7-5. Elena and Marjan made a better start to the second set and, with a break in hand, Marjan served for the match. At 5-3, 40-30, applause broke out on the adjacent court where the men’s doubles had just finished. 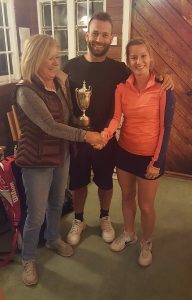 Elena and Marjan won the matchpoint to ensure both matches ended in perfect synchrony so that everyone could hotfoot it back to West Heath where people were already gathering in the rain outside the locked West Heath gate for the BBQ! The weather today was just about good enough to permit the grass to be used for the men’s singles semi-finals. The scheduled matches also included the mixed doubles final. On the centre court there was a showdown between the third seed, Marcio Sugui and the second seed Cedric de la Chaise. Marcio approached the match confident he would be able to break Cedric’s serve on occasions, but not so confident he could hold his own serve. In the first set the French noises coming from Cedric would have led you to suppose that he was losing heavily. Certainly Cedric felt his movement was constrained by the moisture on the court. But the reality was that Cedric’s ability to reach wide balls and do something aggressive with them made it difficult for Marcio to get as clean a hit with his topspin placed shots as he had against Logan Mair in the quarters. Marcio was unable to prevent Cedric taking the first set 6-1. In the second set Marcio was indeed able to break Cedric more than once, but had difficulty holding serve and the net was that Cedric’s powerful shots were still just too strong for him. Cedric won the match 6-1 6-4. The second semi-final featured sixth seed Greg Lim against top seed Graeme Pearson and turned into an encounter you just could not take your eyes off. The consensus seems to be that all the second team men have improved considerably over the last twelve months as a result of regular play. Greg has been playing two or three times a week over winter on fast and often wet artificial courts and had already disposed of the fourth seed Philip Reid in a tight three-setter so could also be described as match tight. One summer a few years ago Graeme had been between jobs for a few months leading up to the tournament, had taken the opportunity to play most days and had been on top form during the tournament. 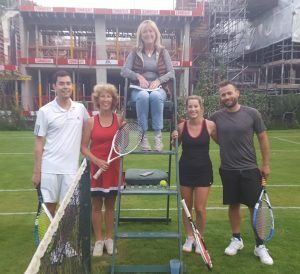 By contrast, Graeme has had a lot happening in his life recently, including a house move, and tennis has very much had to take a back seat, so the tournament came as a welcome chance to enjoy some play. 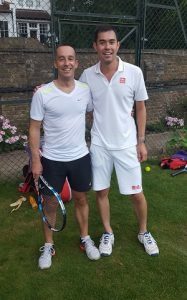 Both Greg and Graeme tended to play safe, hitting the ball down the middle of the court from the baseline unless there was a clear opportunity to come in or to hit a winner or the situation required a passing shot. There is a huge difference in the strokes though. Greg has a very late take back and a lengthy follow through which is ideally suited to the often erratic bounces on the grass at present. His strokes are generally very flat and thus fast but predictable (apart from the grass bounce). By contrast, on the forehand Graeme usually winds up with a huge looped take back in preparation for heavy topspin, and the increased difficulty of adjustments makes the bad bounces more disruptive to his stroke. He also seemed to use exclusively sliced backhands. The first set was a very tight affair which went to 6 all. The tie-break was equally tight, and equally went to 6 all, but Greg managed to take the last two points to win it 8-6. Graeme was playing more tentatively than usual, taking fewer risks, and often starting rallies with a shorter returned ball then extending the depth. By contrast Greg was trying to hit closer to the baseline and putting heavy pace on the ball. In the second set Graeme stepped up his game somewhat and broke early, and at this point it became clear that the mixed doubles final involving Greg was at least likely to be delayed for a third set and at worst delayed to another date. Although the rest of the set was close, Graeme managed to preserve the break and won the set 6-3 to equalise. 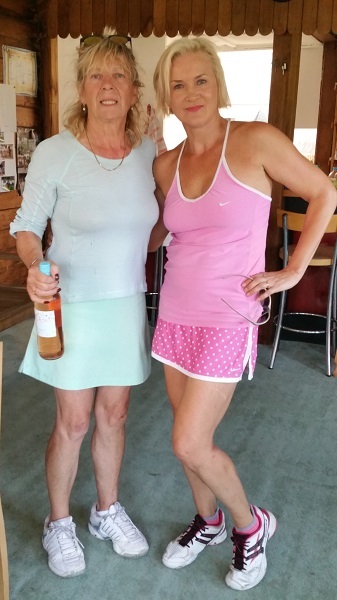 It was then that Greg’s mixed doubles partner, Marjan Denis, gave up and changed out of her tennis outfit! In the third set Greg stepped up his game, going for the lines more and hitting a little harder, thought Graeme was still a little tentative, spurning the chance to go for a side line or drop shot winner on occasions. The bad bounces also left their mark a little as Greg coped slightly better with them. 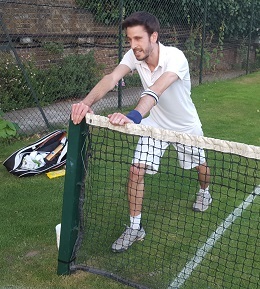 Greg broke around three games in, and despite Graeme’s efforts he could never break Greg back to rescue matters, leaving Greg to take the match 7-6[8-6] 3-6 6-3. Thus Greg the giant killer has disposed of the sixth and second seed in his progression to meeting Cedric de la Chaise in the final. The match finished at 8:15 pm so there was no hope of playing the mixed final. Graeme said he very much enjoyed the match, despite having lost, and certainly he looks happier in the picture above than Cedric generally does in his photos when he has won! On the face of it Cedric will be the strong favourite for the final. Greg will be facing someone who does not know the meaning of the word “tentative” and can reach a lot of balls to hit winners that most of the rest of us might give up on. But there’s no doubt Greg is playing well and confidently, so if Cedric falters it may be another matter. Despite the weather, we have had some super matches to watch this tournament, and the men’s final will be another fascinating encounter. Book your seat early by turning up at 2 pm on Saturday to watch it! While all this was going on, Elena Valarche and Ros Norkett, the third and second seeds, were playing out their ladies’ singles semi-final. Despite the seeding it appears that Elena had the upper hand and despatched Ros 6-0 6-1. It now looks as if the mixed doubles final will be played on Wednesday 9 August. Rachael Gangji prepared the annual delicious fish pie and Lara provided the famous pavlova and cheesecake. 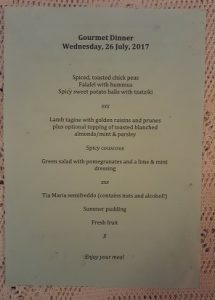 Thanks to the two chefs for a delicious meal. The weather was unkind enough to make the grass unplayable, so all matches had to be played on the two hard courts. A group of determined spectators drew up chairs on the grass courts to view proceedings and nibble the various starters which were handed around. On the near court was the resumption of the men’s singles quarter final between Logan Mair vs Marcio Sugui. On Tuesday evening Marcio had just broken Logan to lead 3-2 in the final set (see yesterday’s tournament report) when the grass got too slippery to continue, Logan took a tumble, and the match was halted. On the resumption Marcio won his own serve to lead 4-2, final set. Logan put in a determined stint to break back to reach 6 all and force the tie break. At this point Logan made a couple of mistakes on smashes to give Marcio momentum and Marcio took full advantage to win the breaker 7-1 and the match 6-3 5-7 7-6[7-1]. 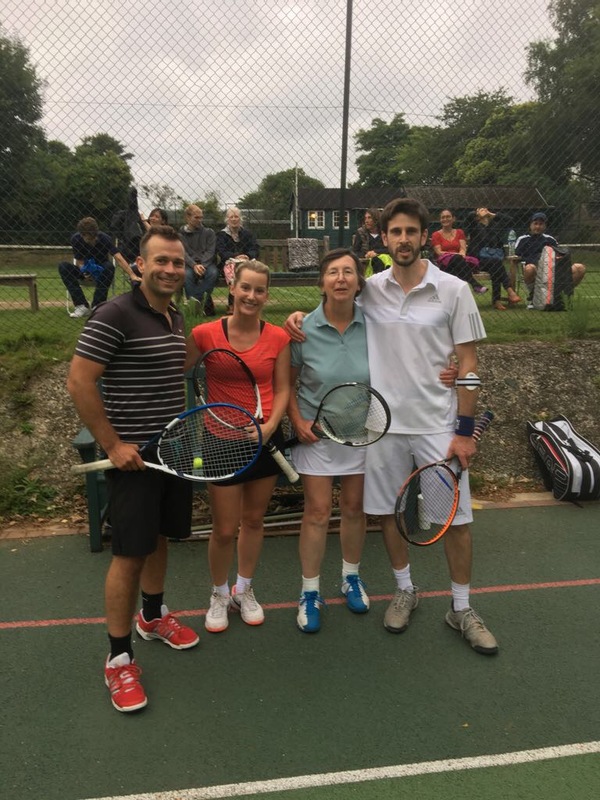 [James writes:] Whilst the singles battle was raging, on the other court a mixed doubles semi final was taking place, between Lesley South and James McKenzie, against Tim Simpson and Anais Reding. Tim served first, and held to love. A feat not entirely matched by James who managed to hold, just about, after a series of deuces. 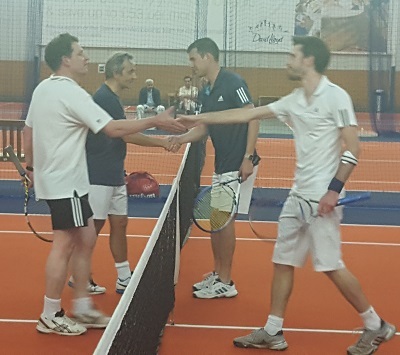 The strong play and hard hitting from the Anglo-Belgian alliance proved difficult for the defending champions to deal with, as James’ shouting testified to, and the Alliance won the first set 6-3. Starting off the second set, James again made a meal of holding serve, but managed just about. After a few more games, the match was moved to the vacant court, much to the delight of the crowd. It was difficult to adjust to the brighter court; Lesley remarked that she preferred the gloom of the far court. Alas, the second set followed much the same pattern as the first, with strong play from the Belgo-English pairing. At 5-2 Anais served for the match but could only manage a double fault. Choke. However, undeterred, she mustered full serving and power mode and held serve to seal a deserved 6-3 6-2 victory. If she had served more double faults, one could say that she made a moule out of it… Notwithstanding, they progress to Thursday’s final to face former finalists Marjan and Greg. 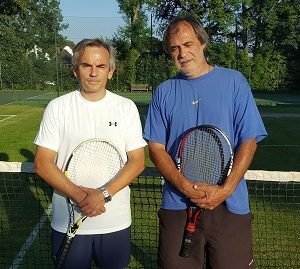 There were also two men’s doubles semi-finals. On the far court James McKenzie and Greg Lim were pitting their wits against Sultan Gangji and Graeme Pearson. I leave it to James to describe what happened…. [James writes:] This semifinal match was a rerun of last year’s final, although this year the fixture was played on the far hard court. Having won the toss and elected to serve, Greg started emphatically, with a deliberate serve and volley game. A few smashed volleys later and the game was taken. Graeme served from the same end, but he and Sultan were less emphatic, as they gifted Greg and James some break points. However, none were taken, with Graeme and Sultan eventually holding. They turned the screw on James’ service game, to take an early break. Despite opportunities to break back on both Graeme’s and Sultan’s service games later on in the set, the set went the way of the defending champions, winning it 6-4. The second set began after a lengthy break whilst James acquired more lime squash. This didn’t do much for Greg’s now cold shoulders as he started the second set. Quite what the precise order of games was, but Graeme and Sultan found themselves 4-1 up with Graeme serving. Always a keen observer, Sultan sensed from Greg’s and James’ body language that the set was up. However, five points later, Graeme’s serve was ‘broken to 15’. James served, and held to take the score at the change of ends to 4-3. And so began Sultan’s Game of Twenty Deuces. Back and forth went the momentum, pendulously, as neither pairing could secure two points in a row. The Enormity of the Game was lost on nobody, with all four players choking just a little bit. But in the end, it was Greg and James who prevailed to level the score on the proverbial board. Greg served, and held, in perfunctory fashion to take a 5-4 lead and win 4 in a row. Graeme stopped the rot for the defending champions to level it at 5-5. James managed the same, to leave Sultan serving to stay in the set. Two set points materialised for Greg and James, with the first going begging in the encroaching gloom. The next point, at 30-40 was a long rally with all four players in at the net. Dinky placement volleys were very much in vogue; James pushed one down Graeme’s line who, at full-ish stretch returned it gamely enough; thankfully it was pushed into the Sultan/Graeme mini-chasm and the set was taken 7-5. With the score at 6-4 5-7, the match was suspended. The deciding match tiebreak will be played on Saturday. Following on from adopting a psychological plan in the 2016 tournament to win a difficult singles match against a top seed, Tim Simpson was working on a new approach to his men’s double match with Marcio Sugui against Logan Mair and Cedric de la Chaise (at least according to James’ post). 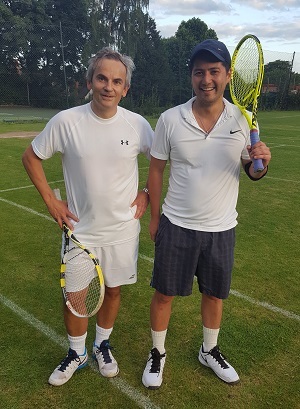 The plan was not spectacularly successful in the first set, which Tim and Marcio lost 6-0, but came into its own in the second set which was more fiercely contested. But one difference between the pairs in the second set was the quality of the lobs from Logan and Cedric and the final result was that Cedric and Logan won 6-0 6-4. 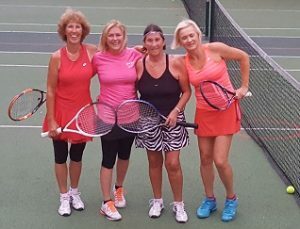 The court was then taken over by the ladies’ doubles match of Barbara Thomas and Jane Boyle vs Marjan Denis and Elena Valarche, the match resuming at 6-3 3 all after stopping for dew and bad light late on Tuesday evening. On the resumption, Barbara and Jane played well to break and hold twice to give them the second set 6-3. In the increasing gloom it looked like the champions tie break in lieu of a final set would go to those who had always eaten their carrots. Elena and Marjan seemed to develop early momentum as Jane and Barbara made a few mistakes and took the tier break 10-5 for a 6-3 4-6 [10-5] victory. 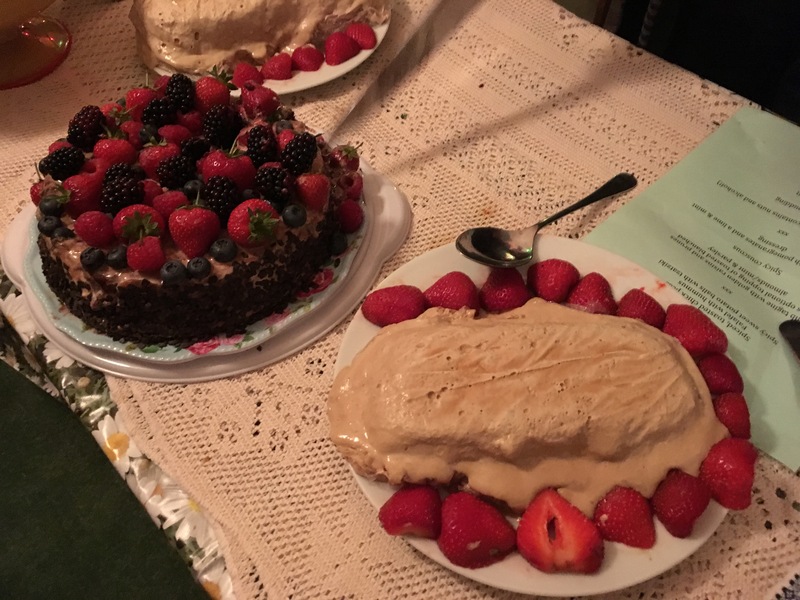 In addition to the summer puddings and semifreddi, Bruna (of Bruna and Marcio fame) provided an exceptional, and exquisitely decorated, chocolate cake. It went down a storm, and we hope to see more of Bruna – perhaps when Marcio plays Cedric in the semi final on Thursday! Or perhaps on The Great British Bake Off. In contrast to the night before, it felt like a different country on Tuesday evening at West Heath. The sun was shining and it could almost have been described as ‘warm’. Getting the action started was a mixed doubles semi final, between second seeds Marjan Denis and Greg Lim and seed-slayers Barbara Thomas and Peter Davies. Could the unseeded challengers continue their progress through the draw, or would they come unstuck? [Report from Peter.] Marjan and Greg both played very well and made few unforced errors. Marjan hit one or two beautiful low volleys. Their strategy was to target Barbara as much as possible and although Barbara hit her groundstrokes and volleys well she could not get past the two seeds and was feeling the pressure. She said she could have been more aggressive and taken the game more to the seeds. Peter generally served well and ran for everything, but the seeds were generally too strong. The challengers’ only games came from Peter’s serving and breaking Greg’s serve during a lapse in his concentration. Marjan and Greg won 6-2 6-1. They were finalists last year, and will be this year too. My money is on them to win this year, at least if they can play as they did during this match. 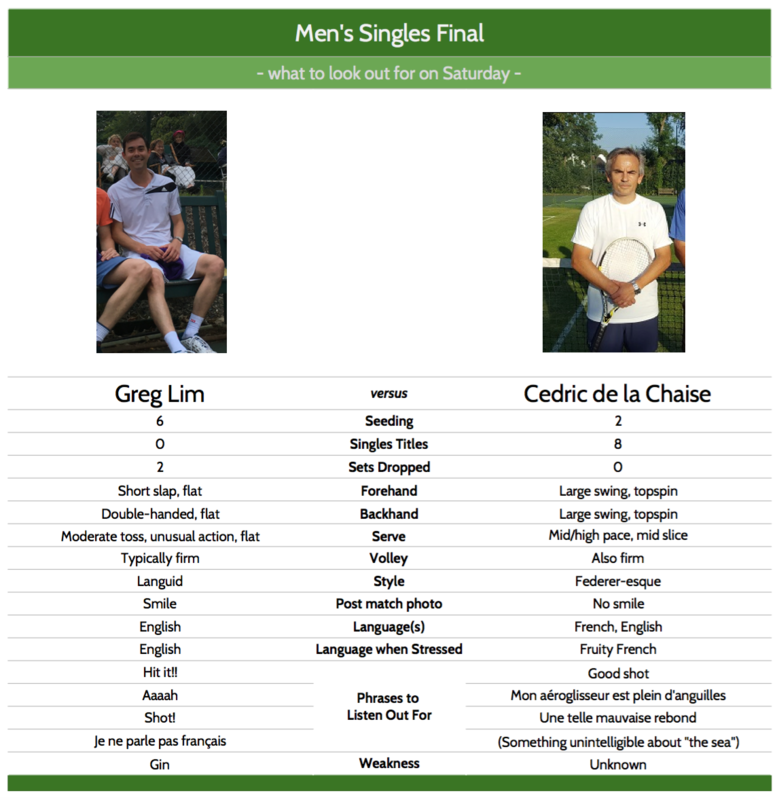 On the adjacent court, the second seed Cedric de la Chaise was taking on new West Heathen Lajos Szucs. Whilst little of the match was observed, it seemed that Lajos’ touch was a little off (Susanna said as much), whilst Cedric was returning shots that would otherwise have been winners. Cedric advances to the semi final, with a score of 6-2 6-0, to face either Marcio or Logan, who were due on court afterwards. One day Peter will get a picture of Cedric smiling! Over on the far court, a ladies’ doubles semi final was taking place. 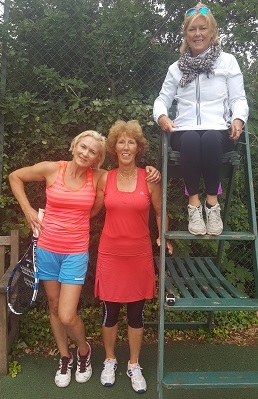 Lucky shoes/pants/shirts or not, Lesley South and Moira Duncan took the first set off the defending champions Ros Norkett and Vandana Talwar, to win it 7-5. Whilst the ‘heat rule’ was not in place, a 10-minute break was taken nonetheless to tend to the Gourmet dinner (the lesser known ‘can’t stand the heat rule’). What Ros and Vandana did in the interval is anyone’s guess, but they rallied in the second to win it 6-2. The match tiebreak went with the all-important momentum, with the first seeds winning 5-7 6-2 [10-4]. Back on court 1, Graeme Pearson had changed out of his work clothes for his match with James McKenzie. With the sun shining down on court 1, the non-Clubhouse end was a bit of an evolving lottery throughout the match. As the sun swung further round, various parts of the court became more treacherous, whilst others became positively hospitable. The first game was a nervy affair, with James regretting having elected to serve, which duly went to the first seed. Alas, it wasn’t all bad, as the score was pegged back to 3-3. Graeme’s tried and tested strategy is typically to get every ball back, which is highly infuriating. However, with the slippy courts a few points were hoovered up by James and his shorter balls. Nevertheless, Graeme continued to win the first set 6-3. At this point the court was becoming exceedingly slippy, with James dancing around like Bambi at times (another Zinger from Moira™). Graeme’s shoes seemed better suited to the task. The second got underway, much like all sets do, with some serving, returning and rallies. Somehow James found himself 3-1 ahead, with break points to go 4-1 ahead. Alas Graeme showed his true mettle to hold, and pegged the score back (familiar story) to 4-4. The next few games went with serve to 6-5, with James having to serve to stay in the match. Clearly the pressure got to James, as Graeme ‘broke to 15’ to take the match 6-3 7-5. Logan Mair played Marcio Sugui. [Report from Peter.] For a change Logan had to serve and play as if he meant it, abandoning his normal laid-back style. Marcio took full advantage of having brilliant topspin strokes. These have the advantage he can put the ball near to the sidelines closer to the net. Where possible he used this to manoeuver Logan about the court until there was a chance to hit a winner into the open court. Marcio took the first set 6-3. The second set saw Logan stepping up a gear to put more pressure on Marcio, thumping down first serves, though Marcio’s game plan was still in effect. All of this cancelled each other out and the score reached 6 all to force a tie break. Again, this was pretty even, but Logan just got the upper hand at the end to win it 7-5 to even up the match. The light was starting to fade, but the match was only suspended when Logan slipped on the dewy grass and they gave up at 3-2 to Marcio. The match was due for completion Wednesday morning. And in the ladies doubles, Elena Valarche and Marjan Denis took on Jane Boyle and Barbara Thomas. This match was also suspended due to poor light and a slippy court and is due for completion Wednesday evening. 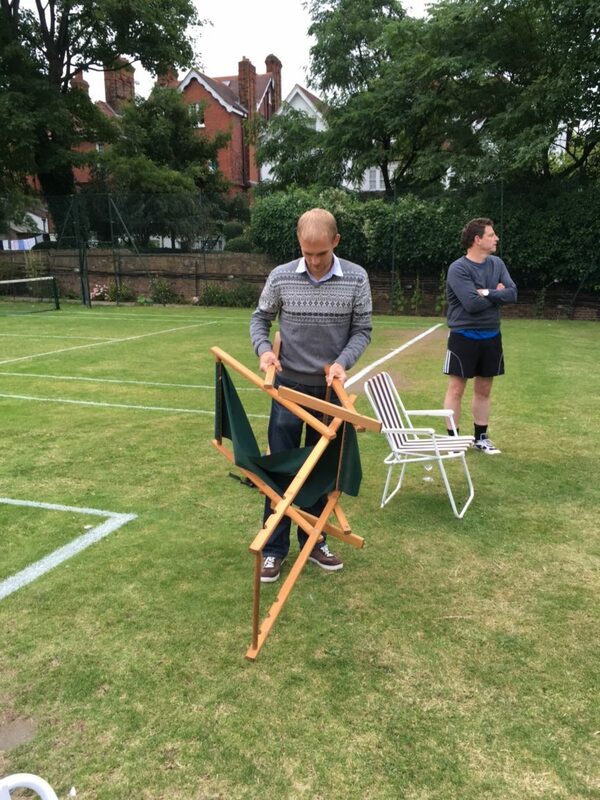 Whilst a gargantuan battle was raging on the adjacent hard court, Stan, the club’s very own Marcos Baghdatis, was engaging in a battle of wits with a rather stubborn chair. However, I am pleased to report that where the rest of the club members had failed, Stan persevered and eventually managed to contort the chair into its intended position. Bravo! Many thanks to Jane for capturing the moment for posterity.